I like zoos.Â Who doesnâ€™t?Â Although it is at least a little cruel to keep animals caged up like that, all the best zoos keep some of the best scientists on staff.Â They feed the animals great food, they live in optimally designed environments, all of their needs are met.Â Of course, nothing compares to being in their natural habitat.Â But without zoos, our exposure to much of the living world that we are currently sacrificing would be lost.Â Zoos create an environmental conscience.Â Plus, there are some great animals there and now you have a chance to see them in this new collection of television episodes. Starting this May 12th, now available on DVD from Infinity Entertainment Group and Smithsonian Networks comes one of the wildest, cutest and most cuddly television adventures in a long time.Â Loose At The Zoo is ready to come crawling right our of your television screen and bring a whole world of amazing zoo animals into the middle of your living room.Â Bring home this educational and wholly entertaining collection of episodes today! 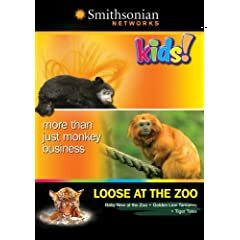 This series gives you an exciting look into the lives of some of the many animals found at the National Zoo in Washington D.C.Â There are three episodes included in this DVD.Â The first of these is â€œBaby New At The Zoo.â€Â In this episode, we meet four animals who are new at the zoo.Â There is a baby Golden Lion Tamarin, a baby Sumatran tiger, a baby Kori bustard (itâ€™s a bird, I didnâ€™t know that either) and a baby sloth bear.Â The second of these is â€œLoose At The Zoo â€“ Golden Lion Tamarins.â€Â In this episode, we get to hang out with this whole family of monkeys as they go through all of their various daily routines.Â The third of these is â€œTiger Tales.â€Â In this episode, we tag along with a group of cute tiger cubs as they go from little cubs up until they can walk and swim.Â Youâ€™ll also find out that they have unique stripe patterns, just like we have fingerprints. The special features included in this DVD are a widescreen format, Dolby Digital Surround Sound and subtitles.Â Normally, I would say that this collection of episodes needs more special features, but the three episodes were so great that they more than make up for any absence of other features. What a great collection of episodes.Â It was both highly informative and nearly unbearably cute.Â The episode about all of the tiger cubs was just cute overload.Â It doesnâ€™t matter who you are, you will fall in love with those little tigers right away.Â Getting to follow the Tamarins around was pretty interesting, especially when it came to the social interactions.Â Itâ€™s amazing just how highly evolved many animals are when it comes to social aspects of life.Â But the best episode would be the first one where we get to meet the four new animals.Â I had not heard of two of them and it was full of very interesting and educational information.Â Itâ€™s well worth watching and you will certainly enjoy it as well. Let this great DVD Loose in your home today! No user commented in " Movie Review: Loose At The Zoo "